Marketers are artists. We create marketing programs that are our works of art, and are catalysts for the growth and success of our organizations. Being a marketer means it’s necessary for the creative wheels to constantly be churning, and constant innovation is key to our success. Like many other marketers, I focus much of my time on developing modern, fresh, unique marketing ideas. However, with the growth of tools for marketing analytics, and the current focus on using big data to personalize marketing activities, being a successful innovator now means being both a marketing artist and a marketing scientist. What is the distinction? 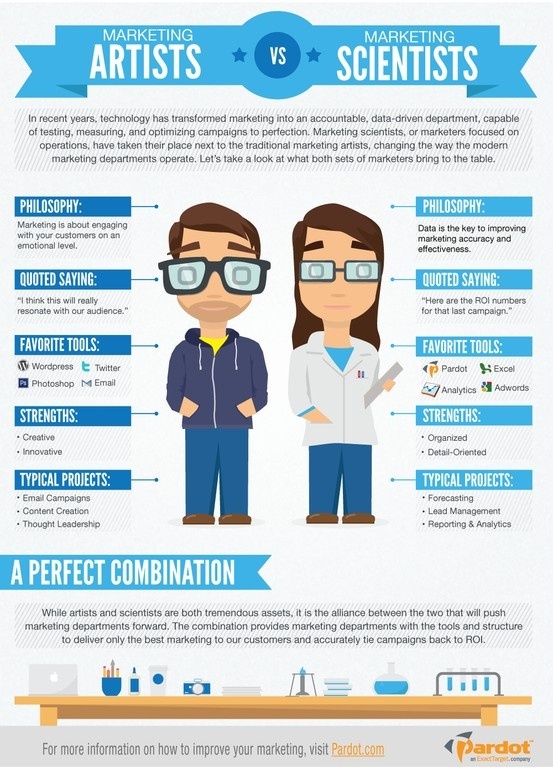 The following infographic shows that marketing artists engage their consumers, and marketing scientists improve marketing accuracy and effectiveness. As I mentioned, I am more of a marketing artist than a scientist. That’s one of the main reasons I find value in being an AMA member. AMA offers a wealth of programs that help me better understand the components of a marketing program with which I am least knowledgeable. Programs that help me better understand the marketing science field give me the knowledge I need to become a better innovator. For example, I recently attended a program about big data – what it is, how other marketers use it, and how big data will continue to revolution the marketing field in the near future. The real value was learning how I could use big data to improve my current marketing activities and how I could innovate and make my marketing ideas more effective. AMA programs are not about sitting and listening. The hour I spend at AMA programs can better be described as a brainstorming session, where I learn how to improve my marketing program while improving myself. For example, while I was being supplied information about big data, I came up with 3 ideas for how using big data could improve my current marketing campaign, while also gaining confidence in myself and my ability to effectively utilize big data. Marketers are artists, but to be innovators it’s becoming more and more necessary to also be a marketing scientist. Combining art with science is a formula for marketing success. AMA can help you increase your knowledge about being an effective marketing artist and marketing scientist, while helping to increase your confidence in your ability to be an exceptional innovator.